Labor Day is a time to relax and think about all the people who came before us who worked hard for so little money. Sort of like me. And that leads to this feature in Political Junkie. 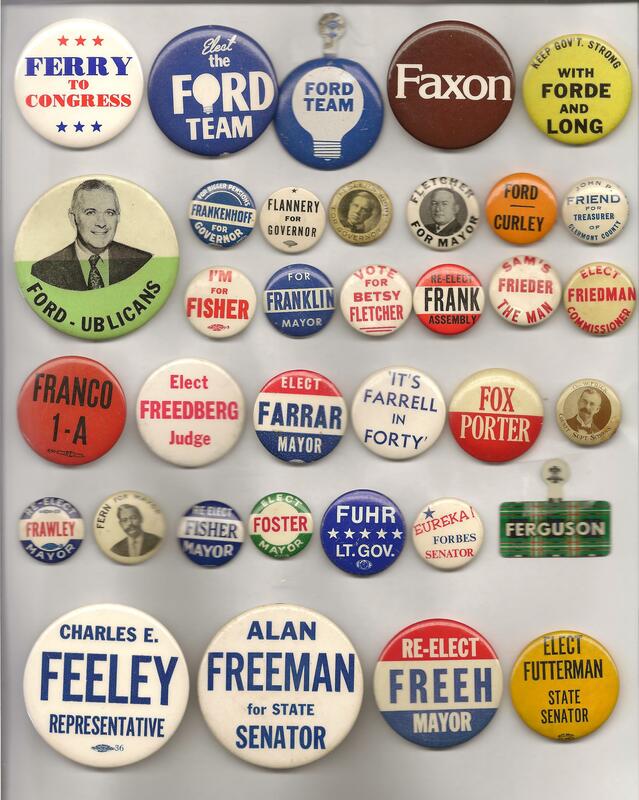 And now we’re back with another selection of campaign items of candidates, this time focusing on the letter “F.” Does anyone know who these “f”olks are? Thank you, and have a safe holiday weekend! Ken, The Frawley for Mayor is for Arthur j.Frawley Mayor of Lynn,Ma. 1943-45 & 52-55. Frankenhoff was Dem. in MO lost the 1940 primary. Data thanks to the CQ report on US elections. This is correct. He was defeated by Larry McDaniel in the Democratic primary. McDaniel went on to lose the race to Forrest Donnell, the only major Republican elected in Missouri in 1940. Donnell only won by 3,600 votes, so they refused to seat him as Governor until the Mo Supreme Court stepped in. It was a big deal and had shades of the old Pendergast machine in Missouri. Charles E.Feeley for State Rep.Republican Primary 1970 13th Middlesex Ma. Lost to Teddy Mann Mayor of Newton,Ma. That button for Frick is a beauty! I wish I could tell you something about it, but all I can say is that it’s awesome. John Fuhr was speaker of the Colorado house, 1971-75. He ran for lt. gov. in the 1974 Republican primary but lost. In 1982 he was the GOP nominee for Governor. Jack Faxon was a Michigan Democratic state senator, 1971-95. John P. Friend was elected County Treasurer as a Democrat in Clermont County, Ohio (just west of Cincinnati) in 1936. Whoops. Clermont County is, of course, just east of Cincinnati. If it were west, it’d be in Indiana. “Fesler’s Right for Governor” – James W. Fesler, R-IN, unsuccessful candidate in the 1920 gubernatorial primary.